Though Gondwana hand selects your accommodations, transportation and activities on our tours, we love it when travelers come prepared. First, a warning: like all natural wonders, seeing the aurora is not guaranteed, but it is very likely if you play your cards right! Going during the right time of year and learning about solar activity, and getting optimal viewing conditions is the best way to increase your chances. Due to the unique weather conditions in Alaska, packing requires quite a bit of planning. 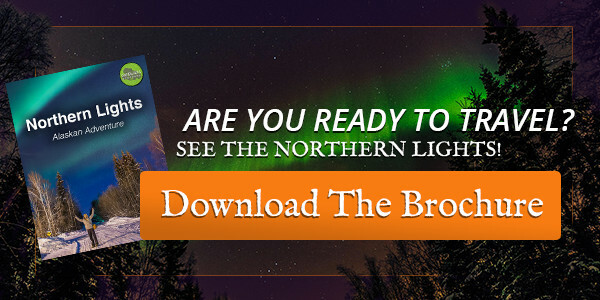 We’ve written about packing tips for the our Northern Lights Adventure and cold weather accessories you may need to kick start your planning. Once you book a trip, you’ll receive a complete packing list and information about renting heavy-duty outerwear. This brilliant display of lights is stunning, yet difficult to capture on camera. Thankfully with Gondwana, “…your guides are also professional photographers who will help you capture the perfect image.” Read Gondwana’s tips for photographing the aurora borealis. Alaska’s wild terrain is a far cry from city life. Being outdoors is a way of life, and our daytime activities are no exception. “While you’re waiting for nightfall you’ll go dogsledding, take reindeer walks, learn to curl, and soak in snow-rimmed geothermal hot springs.” While all of our activities are optional, it helps to be confident walking in snowy, cold terrain. To prepare, take long walks while breaking in your cold weather footwear! 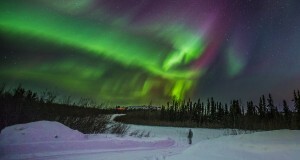 Alaska’s largest interior city is conveniently situated under the auroral oval. It also has consistently clear skies, which increases your chance of seeing the aurora. We spend most nights outside of town at A Taste of Alaska lodge, where a secluded landscape provides optimal viewing conditions.